The Ninja Baker's lemon yuzu cookies dance with effervescent citrus! Highly recommended: A lemon yuzu cookie in each hand. How do you eat cookies? Tart yuzu glaze hugs soft citrus cookies. As soon as I saw dried yuzu bits, I nabbed two packages and set out to make cookies. I confess the yuzu flavor is a tad timid in the cookies. The yuzu taste, however, does sing a tart tune in the sugar glaze. (When baking the cookies next time, I’ll add more yuzu juice and play with coconut flour to compensate for the extra liquid.) With or without adjustments, the recipe for my lemon yuzu cookies is a keeper recipe. A glaze-coated crunchy exterior gives way to a soft citrus cookie. Lemon yuzu cookies are super simple to make. AND no refrigeration of dough is required! 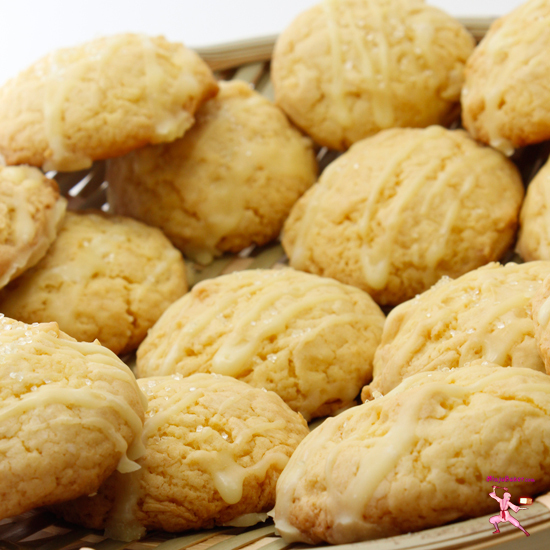 The Ninja Baker’s lemon yuzu cookies are for those who LOVE to save time but still savor scrumptious homemade treats! April 22nd is Earth Day and April 23rd is National Picnic Day. The Twitter chat tonight at the virtual #SundaySupper table is all about picnic-friendly food. This event is being hosted by T.R. of Gluten Free Crumbley . Even if you don’t have gluten sensitivities T.R.’s site is chock full of yummy recipes. In addition to the Ninja Baker’s lemon yuzu cookies, I believe you’ll want to stuff your hamper with the heavenly picnic suggestions below. Sourdough Chunk Cookies  by What Smells So Good? Welcome home lemon yuzu cookies and milk. Wishing you a soft, sweet place to land after a long journey.